Book wriiten by Matthew Barrie (1860-1937), originally pulished in 1911. Based on a play that was first performed in London in 1904. Both versions tell the story of Peter Pan, a little boy who can fly, and his adventures on the island of Neverland with Wendy Darling and her brothers, the fairy Tinker Bell, the Lost Boys and the pirate Captain Hook. Barrie continued to revise the play for years after its debut until publication of the play script in 1928. The novel was first published in 1911 by Hodder & Stoughton in the United Kingdom and Charles Scribner's Sons in the United States. The original book contains a frontispiece and 11 half-tone plates by artist F. D. Bedford (whose illustrations are still under copyright in the EU). 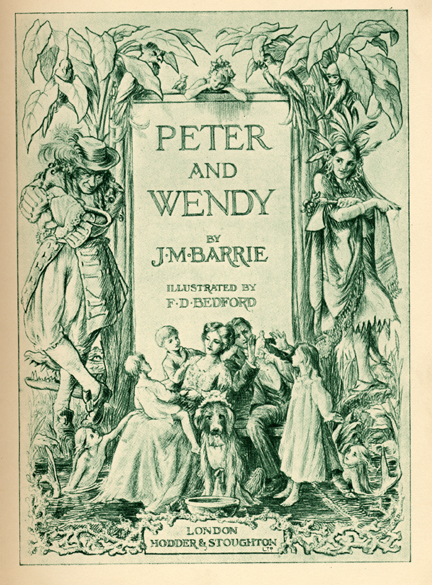 The novel was first abridged by May Byron in 1915, with Barrie's permission, and published under the title 'Peter Pan and Wendy', the first time this form was used. This version was later illustrated by Mabel Lucie Attwell in 1921. In 1929, Barrie gave the copyright of the Peter Pan works to Great Ormond Street Hospital, a children's hospital in London. Kate was inspired by this book to write the song In Search Of Peter Pan.